Lets welcome the latest production from J Team productions and the cast of Ah Boys to Men (1 & 2) back onto the big screen. With the locally successful army adaptation on National Service in the perspective of the young cohort of Generation Y, the director and cast has returned yet again to bring you another round of their trademark comedy style with a blend of emotions mixed up in the bunch. 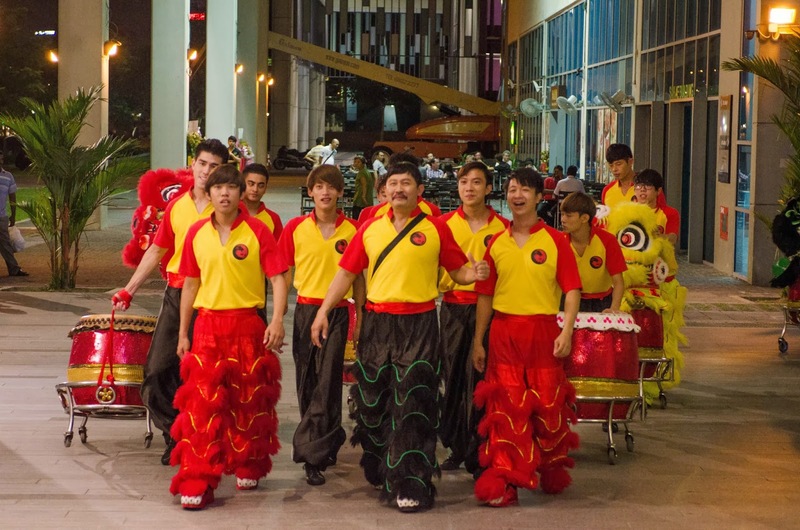 The film revolves around a Lion dance troupe named "Tiger Crane" with the main plot focused on the 5 main cast members. A string of incidences causes a rift in the group and thus leading the creation of a new Lion Dance troupe named "Storm Riders". 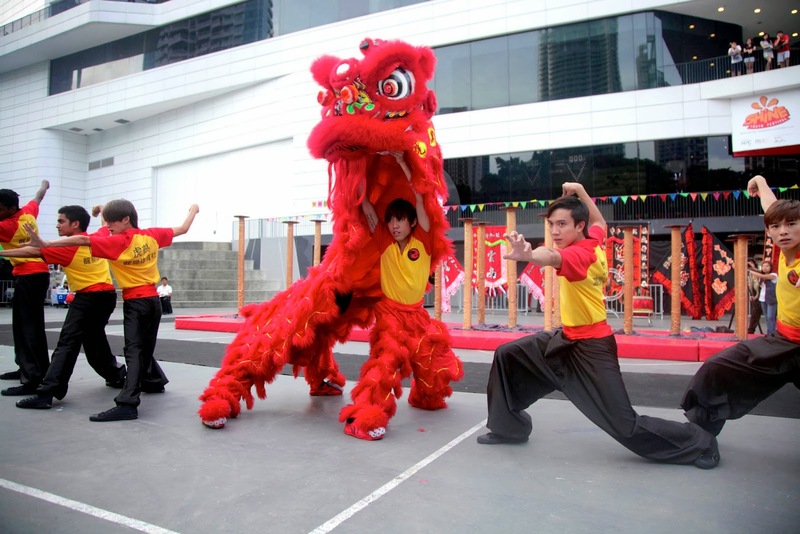 With the rival Lion Dance troupe "Black Hawk" joining the fray to compete in the Biggest Lion Dance Competition, all 3 Lion Dance troupes whips out all their skills in order to win the competition. Without revealing much of the film, let’s talk about the various characters. The characters lack real motivation towards the competition. The finale of the competition seems to be undermined by all the sub plots being thrown into the film to in order to extend the length of the film. Audiences aren't looking for their money's worth by siting longer in a cinema but rather be entertained during the entire duration of the film. 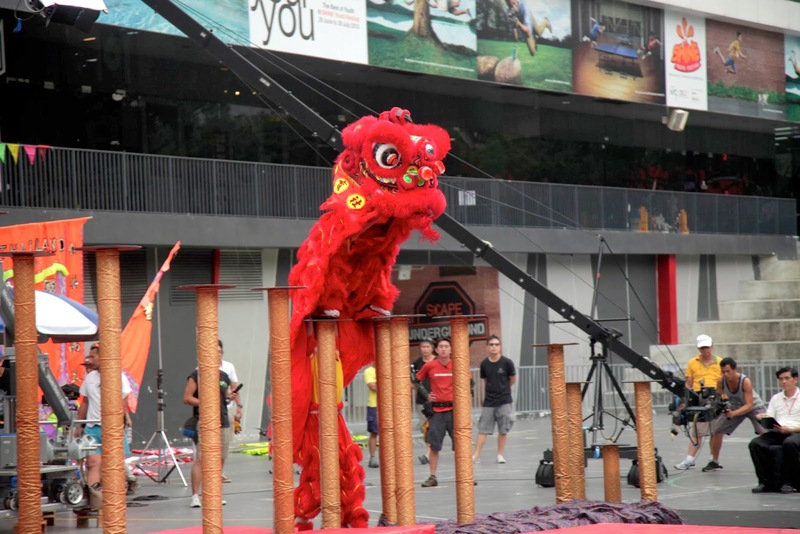 Truly Singapore may not excel in the field of CGI effects in film but the highlight of "The Lion Men" resides in the intricate choreography of Lion dance stunts. Back in the 1980s and 1990s, stunt men/women being hung on iron wires performing aerial feats and poses. Looks like that nostalgic feeling has returned after a long hiatus. No Hollywood CGI effects of actors performing stunts on a monitor screen, this is real people performing real stunts and getting hurt in the process. 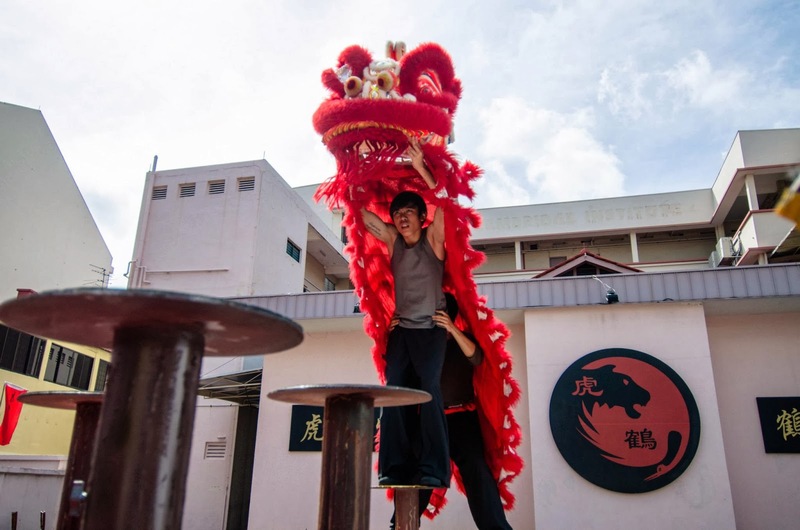 Having a real stuntmen perform these lion dance stunts showcase an authenticity in film that has been slowly lacking in the years. This is probably why we still go back to Youtube to watch Jet Li do the Lion dance fight in "Once Upon a Time in China 3" or Jackie Chan in his heydays performing superhuman stunts which would send shivers down your spine. Truly a highlight to gawk and be amazed , although it helps if more detail was paid towards avoiding camera shots that reveals the stuntmen instead of the actors (IMO takes away some of the film's magic). A true delight to view is to watch the opening scene to ""The Lion Men". 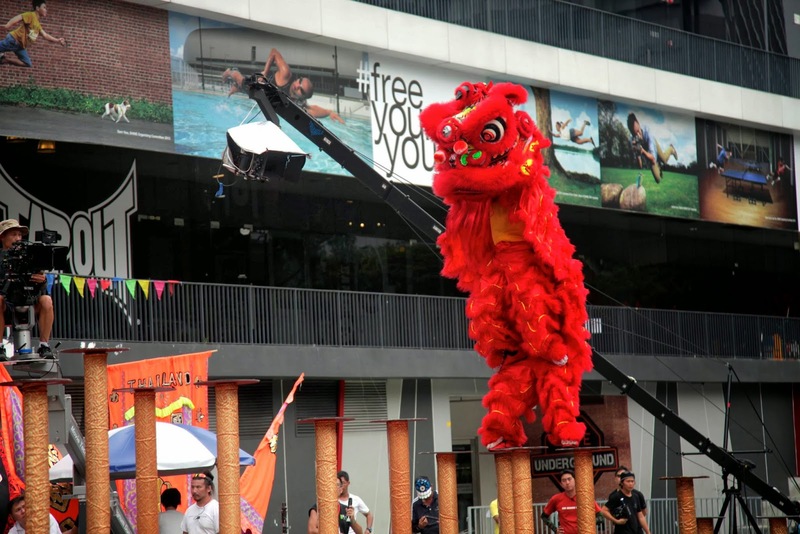 Aerial shots to capture the traveling Lion Dance troupe in their lorry to well angled shots to capture the stunts of the Lion dance on stilts presents a wondrous insight to present the emphasis on Lion dance culture in Singapore. Regarding the cast, apart from the main 5 boys that are at the centre of the film, they each brings forth a different flavour to the plate and present themselves as uniquely as possible. I appreciate the effort of trying to act to the best of their abilities but it could have been more animated especially trying to setup comedic moments or puns. With a new young cast of non-professional actors and actress part of the film, the fresh new faces presents the film in a new light but sadly the acting skills becomes too apparent on screen and it reeks of awkward reactions and uneasy line executions. It seems Chen Tian Wen is truly pulling off all the acting skills he has been amassing over the years. Portraying as the Lion dance troupe master, father figure and friend to his disciples, he captures all the stereotypical traits perfectly especially pulling off the expressions and line exposition for the various scenes, definitely stole the show. In conclusion, J team has placed the film at the perfect occasion to open the film. As the nation goes into a full blown Chinese New Year mood, "The Lion Men" is in for a huge crowd of film audience ready to catch movies over the long weekend. Although my suggestion is try to give a blind eye towards the over the top blatant product placements in the film which became more of an eye sore as the film progresses, go ahead and break out in laughter with some well-timed funny moments and gravity defying stunts might alleviate the pain of paying a full priced weekend movie ticket.